TAMPA, FLA. – Having won seven of its final eight regular season games to reach a bowl game in 2015 and returning 93 percent of a record-breaking offense, USF learned the path it will navigate in 2016 as the American Athletic Conference released schedule dates for all 12 conference teams. Kick times and television arrangements will be announced at a later date. Following four previously announced non-conference match-ups to start the season, including a Saturday, Sept. 24 home date with what is expected to be a top 10 ranked Florida State team, the Bulls will open conference play on the road for the second-straight season when they travel to Cincinnati on Saturday, Oct. 1. USF ran over the Bearcats 65-27 in Tampa last year, setting a school record for points in a half (51) and in a conference game (65) while totaling 361 yards rushing. Stadium. The Bulls downed ECU 22-17 on the road last season as Quinton Flowers hit Rodney Adams with a 67-yard, game-winning touchdown pass in the closing minutes to begin a string of four-straight wins to close out the regular season. It will be the “USF Friends & Family” game corresponding with the University’s weekend event. USF returns to Raymond James on Saturday, Oct. 15 vs. UConn, a team the Bulls downed 28-20 in Connecticut last season behind three receiving touchdowns from Adams. UConn will be the Bulls’ Homecoming opponent, capping a week of activities on campus that begin Oct. 9. The Bulls will play the first of back-to-back Friday night, nationally televised games on Friday, Oct. 21 at Temple. That game, vs. the defending American East Division champion will be televised in primetime on ESPN. 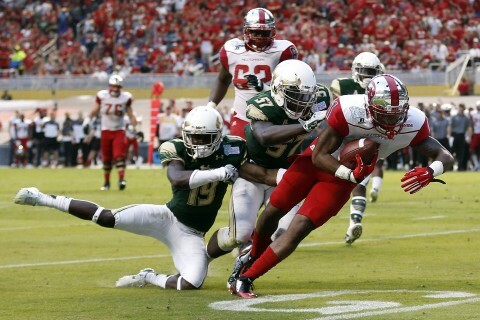 USF rolled over the Owls, 44-23, last year in Tampa as Marlon Mack posted 230 yards and two touchdowns rushing. USF returns to Raymond James on Friday, Oct. 28 to face Navy in a primetime clash on ESPN2. The Bulls fell 29-17 at Navy last year after leading 17-16 late in the third quarter. The Navy game will serve as USF’s “Salute To Service” game with the Bulls’ honoring current and retired military and veterans. USF gets its bye week during the 10th week of the season before a final stretch that includes back-to-back road games. That stretch begins on Saturday, Nov. 12 at Memphis, a team USF fell to, 24-17, in Tampa last year after jumping to a 10-0 lead. The Bulls hit the road again on Saturday, Nov. 19 at SMU, a team USF downed 38-14 in Tampa last year behind 201 yards and three touchdowns rushing from Flowers. USF wraps up the 2016 regular season with the rivalry game vs. UCF on Saturday, Nov. 26 in Raymond James Stadium. The Bulls steam-rolled the Knights 44-3 in the traditional Thanksgiving weekend game last year in Orlando as Flowers accounted for five touchdowns and Mack posted his fourth-straight 100-yard rushing effort. 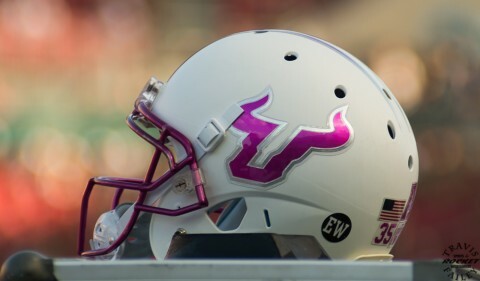 The Bulls’ previously announced non-conference dates are Saturday, Sept. 3 vs. Towson, Saturday, Sept. 10 vs. Northern Illinois, Saturday, Sept. 17 at Syracuse and Saturday, Sept. 24 vs. Florida State. 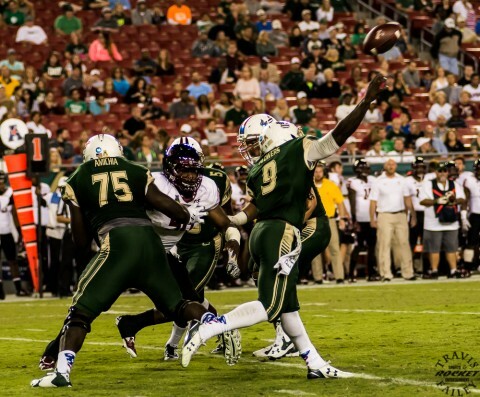 A record setting 2015 USF offense that rolled to nearly 6,000 yards and scored 54 touchdowns returns to Raymond James Stadium with its record-setting quarterback Quinton Flowers, running back Marlon Mack, and wide receiver Rodney Adams on September 3 for the first of seven home games. USF will host four games against 2015 bowl game participants with Florida State, Navy, UConn and Northern Illinois coming to Raymond James Stadium, which will see the first of $100 million in renovations in 2016. Florida State (No. 14) and Navy (No. 18) finished 2015 ranked in the Top 25 and had a combined record of 21-5. The 2016 USF Football Season Ticket Fan Contest begins Friday, Feb. 12 and will see prizes awarded to two lucky Bulls fans every Friday through March 25. The football priority renewal period for all Bulls Club members runs through Friday, April 1. New season tickets deposits for the 2016 Bulls’ football season can be made by calling 1-800-Go-Bulls, visiting www.USFBullsTix.com or in-person at the USF Ticket Office (Lee Roy Selmon Athletic Center) Monday-through-Friday between the hours of 9 a.m. and 5 p.m. Plus, USF alumni, faculty and staff will once again receive a twenty percent discount on football season tickets.